Service Costs > How Much Does Tenting a House Cost? How Much Does Tenting a House Cost? 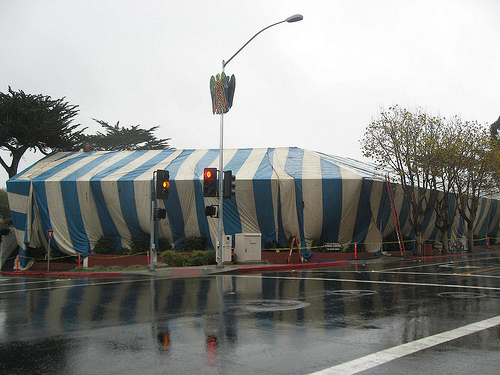 Tenting a house, also referred to as fumigation, is the process of completely covering a house with a sealed nylon tent and then filling it with poisonous gasses, usually sulfuryl fluoride, that eradicates termites. Termites have been one of the most prominent pests that invade homes and can be very hard to terminate. If left untouched, termites can bring down the value of your home and can literally bring down your house. Over the years, there have been ways developed to effectively kill termites, and fumigation is one of the most effective ways to kill them; however, due to the poisonous gasses, a house that needs to be fumigated should be tented to protect the surroundings. According to most experts, however, this process only works best for those who have drywood termites. The cost to tent a house depends on the size of the house, the extent of the damage, the company you choose, the complexity of the situation and geographical location. Before tenting is even considered, you will first need a professional to come out and inspect the property to confirm you have a termite infestation and tenting is the appropriate solution. Since there are so many ways to get rid of a termite, tenting is often the last process a company may choose. Inspections, depending on the size of your home, can cost about $250 to $400 to just have the professional visually look at your home. Tenting a house, depending on the factors mentioned above, can cost about $1 to $3 per square foot. Most companies will charge by the size of the home. Orkin and Terminix, for example, charge according to the size of the home. According to TermitesHelp.com, the average cost to tent a home will depend on the structure of the home, the extent of the damage and the duration. They say you should plan on spending anywhere from $2,500 to $4,000 for a 2,500 square foot home. Ultimate Termite Control says the costs for the average home will be $2,000 to $3,000 for the entire job to be completed. This often the largest factor that affects the price. Which type of termite has infested the home? While tenting is designed for the drywood termite, it can be effective for the subterranean as well. The further the specialist has to travel, the more you’re going to spend in travel fees. Sulfuryl fluoride can come from different brands (Vikane, Zythor or ProFume), or some companies may use a different type of chemical that can affect the cost. During the tenting process, the home will be sealed with a nylon tent, joined together with rolled seams using clamps, and fans will be used to circulate the air throughout the home to prevent the termites from escaping. Once the home is secured, a poisonous gas will fill the home, penetrating the wood surfaces to get to the termites living in the home. By sealing these termites, the entire population will be eradicated as long as the home has been sealed efficiently. After about two days or so, the tent will be removed, the house will be aired out and the air will be tested to make sure you can move back into your home again. Since poisonous gas will be dispersed inside your home, you will need to plan on leaving your home for at least three to seven days before it’s safe to come back home again. If you plan on staying at a hotel, factor in these additional expenses while you’re away from the home. At these high temperatures, the gas will decompose into a corrosive acid that’s able to eat through the home’s structures and surface, often causing more damage than you intended. Because of this, some unnecessary repairs may pop up that you may have to budget for. This process isn’t 100 percent effective, especially if the termites are living deep inside the foundation of the home inside the soil. By living in the foundation soil, the termites are basically eradicating themselves from the poisonous gas, effectively remaining safe while the home is tented. The same can be said about prevention as gassing won’t prevent termites from coming back in the future. Once your home is opened again, the colony is free to come back and start their home again once the home has been aired out. This can, unfortunately, lead to more termite treatments in the future. Any food, houseplants and/or medicine will need to be removed from the home before it’s tented, or in some circumstances, the professional may provide you with special bags to cover your fragile belongings. The gas dispersed inside your home usually has no smell, no color and shouldn’t leave any residue. Tenting a house is just one way to remove or terminate termites from your house and should be used as a last resort. There are other ways to eradicate termites which may be more suitable to your needs and may be cheaper. With that being said, it’s best to get at least three to four opinions before you decide to tent your home. The gas won’t be able to kill the eggs; however, as long as no adults are present, then the nymphs can’t be fed when they hatch, ultimately causing their death. Sulfuryl fluoride is toxic to anyone who breathes it, especially for longer durations and exposure. Since it is odorless and colorless, it can often lead to accidental inhalation, and this is why companies will use a combination of the sulfuryl fluoride and tear gas to create a warning sign to vacate the area, effectively reducing the risk of accidental inhalation. Small doses, however, have no impact on your health. When choosing any professional, always get at least three to five quotes before choosing somebody. If you don’t have the time or don’t know where to start, consider using HomeAdvisor.com to receive multiple quotes for free from licensed and reputable buyers in your local area. Simply explain your situation and contractors should be able to message/call you with ballpark estimates. Check with the company to see if they have any deals currently going on. Some may be able to match a competitor’s price, while someone else may throw in a future inspection for free.